In the steampunk world of Victorian London, Lucy Weston, a character in Dracula, seeks out Bram Stoker to discover why he lied about her in his popular novel. Umm… I love steampunk! And this sounds so intriguing to me. I really like the idea of incorporating Bram Stoker into any new vamp book:) Yes, please! Are you excited about Incarnation? OOOh I like that cover!! Very awesome!! Agreed - with the steampunk angle and the Dracula twist, this sounds like a winner! Cool cover! This sounds very promising! I haven't read any steampunk type books yet!! The cover of this one is great! 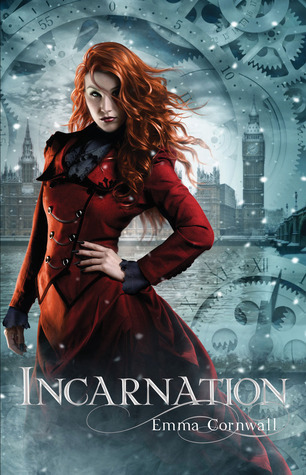 If you're looking to get into steampunk I really liked The Girl in the Steel Corset. Instantly adding to my to-read list. And the cover is interesting. I'll definitely need to pick this one up. Thanks for sharing! I don't like steampunk that much but I love Dracula and books set in London so I really look forward to this one too :) Great pick Rebecca :) ! Can I have this one? Pretty pretty please? Perhaps I've read enough dracula make-overs to finally get burned... But the truth is that I've yet to learn the lesson. I can't stay away from this. And, when it's steampunk? I'm in!